FTSE S-REIT Index declined 5.8% YTD. 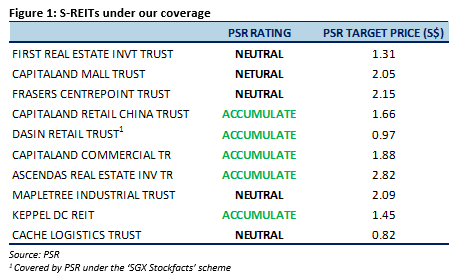 Weakness across all sub-sectors over the past month, with Sabana REIT being the top performer (+3.8% MTD) and OUE Commercial REIT (announced a rights issue on Oct 5) being the worst performer (-11.7% MTD). Sector yield spread of 300bps over the benchmark 10-year SGS (10YSGS) yield remains close to the -1 standard deviation (SD) level as at end-September. 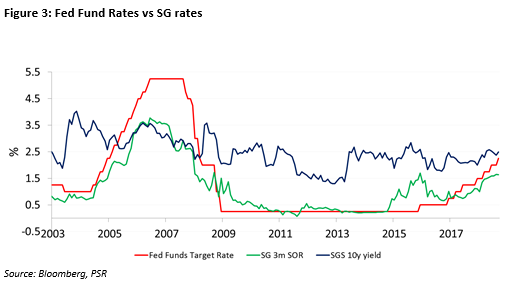 The US Fed’s interest rate hike to 2.25% in September and additional anticipated rate hikes will add pressure on yield spread. 3m SOR continued to rise YTD, ending at 1.63% in September. S-REIT yield spread declined 5.87bps YTD in September. While the yield spread decline has narrowed YTD, it still remains close to the -1 standard deviation (SD) level as at end-September. The 10YRSGS yield currently stands at 2.50%. The Fed Fund Rate increased to 2.25% (first time since March 2008) in September which, in addition to future anticipated rate hikes, will continue to place pressure on the yield spread. Rising interest rates will be a headwind for S-REITs from a yield and interest expense perspective, but it does not necessarily lead to a bearish state as rental growth can be a mitigating tailwind. 3-month SOR continues to rise YTD. Currently at 1.63%, there has not been any major shift in the 3-month SOR MoM. Retail: Jewel @ Changi Airport (NLA: 576k sqft), the biggest addition to retail supply next year, had reported a 90% take-up rate for its retail component ahead of its launch in Mar 2019. 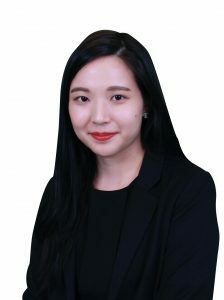 Another 2019 launch would be Funan which had earlier reported a 70% and 60% take-up rate for its retail and office components, respectively – subsequent to this, news of one of its anchor tenants, Newstead Technologies, being in liquidation surfaced. Retail sales (excl. motor vehicle sales) ticked up marginally by 2.4% YoY in August, with Fashion (+6.0% YoY) and Watches and Jewellery (+6.3% YoY) being some of the top contributors. The food and beverage (F&B) index was up 3.2% YoY in August. Office: The co-working space phenomenon continues to permeate the office space, leading enquiries and taking on a form of its own, through the core-flex model. The core-flex model is where SMEs in co-working spaces can choose to lease workspaces as they grow while conventional tenants have the option of flexible space if they need it. CapitaLand had invested S$27 million in co-working operator The Work Project Kingdom (TWPK), which will lease space at Capital Tower and Asia Square Tower 2 from CapitaLand Commercial Trust, in pursuit of the core-flex model at these buildings. As co-working operators expand and as more sectors adopt the core-flex model, office rents could continue on its current upward trajectory in the medium-term. According to Colliers, operator take-up of flexible workspace in Singapore is expected to reach 550,000 sq ft in 2018 (18.5% YoY). Industrial: The scheme of arrangement for the merger between ESR-Reit and Viva Industrial Trust (VIT) became effective and binding on Oct 15. VIT’s stapled securities are expected to be delisted on Oct 22. 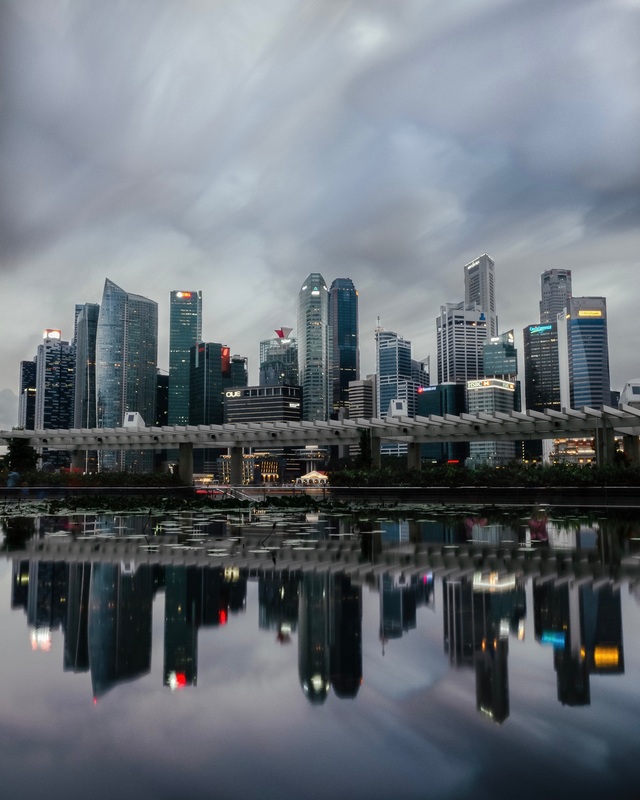 The enlarged trust will have combined portfolio of 56 properties, worth about S$3.0 billion and spanning a total gross floor area of 13.6mn sqft. Hospitality: RevPAR has been trending upwards YoY, up 5.53% to S$202 in August, on both higher occupancy and average room rate. RevPAR is now at a 5-year high. Historically, the months of July and August had clocked the highest monthly occupancy rates for the past three years (FY14-FY17). 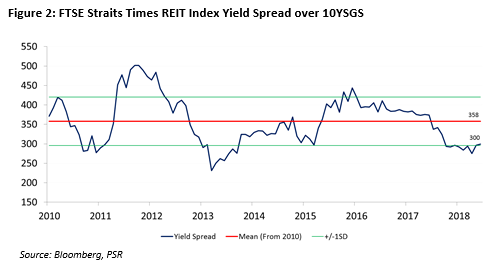 While the S-REIT yield spread is currently near the -1SD level since the global financial crisis, strong rental growth should offset any adverse effects from rising interest rates. As such we have identified pockets of opportunities within each sub-sector that would exhibit these characteristics of healthy reversion rates and strong leasing activity. We maintain Neutral on the S-REITs sector on declining tenant sales in the Retail sub-sector and sluggish net absorption of Industrial space. A marked improvement in tenant sales would allow the retail S-REITs to improve occupancy levels at sustainable rental levels. However, tighter e-commerce competition and the oncoming retail supply glut would continue to weigh on retail rentals in the medium term. While Industrial rents have been stabilising, occupancy still has some catching up to do in order to provide a meaningful catalyst for a sub-sector upgrade. We like the Commercial and Hospitality sub-sectors due to tapering supply after the surge in supply in the prior two to three years. We are cautious on the Retail sub-sector as retail sales and shopper footfall both leave much to be desired. S-REIT yield spread declined 5.78bps YTD as at end-September, to 300bps, still far from post-global financial crisis (post-GFC) average of 358bps. The S-REIT dividend yield is now 5.5%. The 3-month SOR continues to rise YTD, to 1.63% in September, but still lower than the December 2015 high of 1.7%. Tara covers the REITs and Property sector. Previously a consultant advising listed companies on their investor relations strategy, Tara’s transactions experience includes high-profile M&As, IPOs and privatisations. She graduated with a Bachelor of Science (Honours) in Banking & Finance from the University of London.